Personally, I could spend the rest of my life feeding solely on cheese. And while the French are globally known as les maîtres du fromage, as a Greek I think that we do pretty good in this particular food area. As a matter of fact, ancient Greeks considered cheese to be a sacred food. Cheesemaking was given humans as a gift by Apollo, according to the myth. Homer even referred to cheese made of sheep’s and goat’s milk in the Odyssey Saga. Well, that’s probably very long before les French made their Camembert – just saying! Today, Greece produces 21 P.D.O (Protected Designation of Origin) cheeses, according to the Greek Ministry of Agriculture. 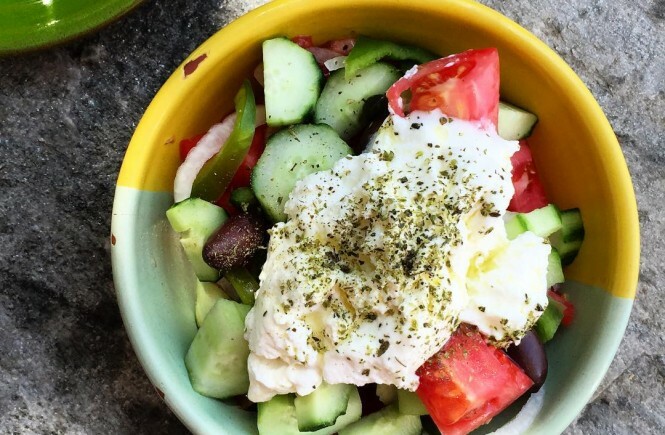 No wonder why there are so many delicious dishes with cheese in Greece. Saganaki is one of the most prominent Greek appetizers and a classic meze for every Greek feast. Saganaki is a hard cheese lightly battered and then pan-seared for an extremely tasty and crunchy texture. Best served with a DIY splash of lemon juice, my recipe for saganaki requires only 5 minutes of your time, simple ingredients, and fast technique. 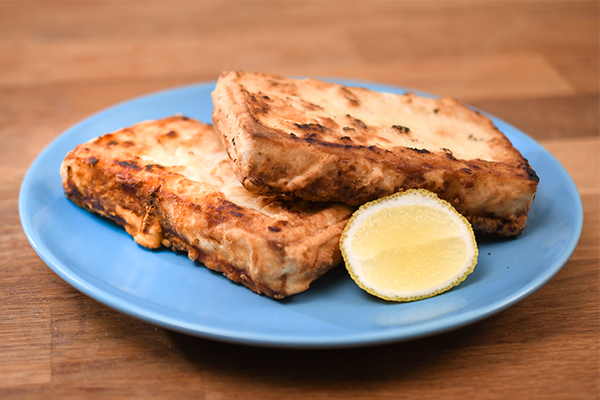 Watch the video recipe for saganaki in the video below! If you liked this video and want more recipes, please subscribe to my YouTube channel (it’s free and very cool!) Kali orexi and OPA! Saganaki is a hard cheese lightly battered and then pan-seared for an extremely tasty and crunchy texture. For this saganaki recipe, you will need a block of hard cheese that will maintain its shape in the frying pan. Cut the cheese into 2 cm thick pieces. Heat the olive oil in a frying pan over medium-high heat. Soak the cheese in cold water. Dredge it into the flour. Fry it for three minutes until golden brown and crispy. Flip sides and fry the cheese for another 3 minutes. Make sure to fry the sides so the saganaki is evenly crispy. Transfe to a platter covered with kitchen paper to absorb the excess oil. Serve the saganaki while still hot. Don’t forget to squeeze a little lemon to it before tasting it!